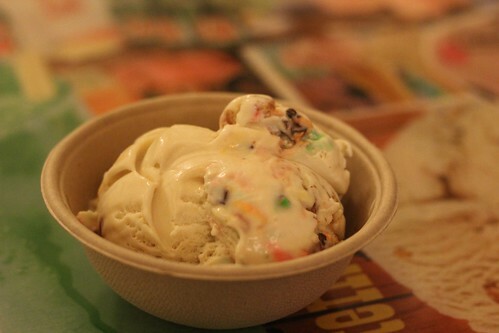 While I was away, I saw numerous mentions of a new flavor at Prospect Heights' Ample Hills: The Munchies. 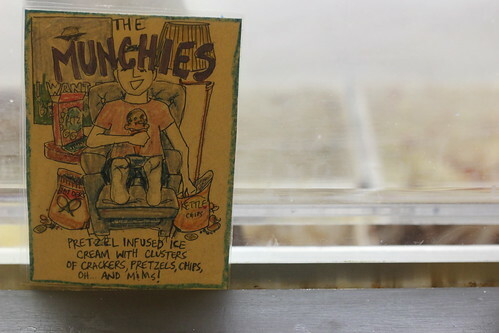 It involved salty and sweet components, and appeared to be absolutely divine, for those of us into that sort of thing. So maybe when Brownie, Lawman, Little B, and I found ourselves a few blocks away for dinner the other night, we might have wandered on over, and I might have completely had my sights on trying The Munchies. I don't know what makes the ice cream pretzel-infused, but I do know that the chunks of pretzels and chips made for crunchy salty good times. And who doesn't love a bit of color from mini M&Ms? If you ended up being a fan of Late Night Snack, this is right up your alley.